The first fifty years of Aunt Molly's life, from 1880–1930, coincided with Appalachia's transition from an agrarian-based economy to one dependent on the mining industry. Lured by the region's rich seams of bituminous coal and other coal sources, outside investors purchased rights to the valuable land, and eventually the region's impoverished residents found themselves beholden to these out-of-state developers who owned their countryside. Aunt Molly witnessed the period in which Appalachian farmland was replaced with mining camps for mineworkers; soon these settlements sprouted into whole company towns. Tucked away in the rural mountains and secluded from the outside economy, these communities were built and maintained by the company mine owners; there were no elected officials. 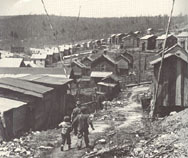 Residents of coal towns were captives of the company, forced to endure squalid housing and unhealthy and dangerous working conditions. Miners were required to use scrip to shop at the company store (usually the only store for miles around) and to send their children to the company town schoolhouse. They were trapped in a paternalistic relationship with the mine owners and operators, and dependent on their benevolence. When the coal industry was booming, most miners survived well enough to permit this dysfunctional relationship to continue with relatively little complaint—since workers rumored to be union members found themselves out of a job and excluded from the community. During the 1920s, however, decreased demand for coal and competition from other fuel sources resulted in a downward turn for the industry; miners and their families suffered the consequences. In the face of national economic crisis, mine owners were forced to reduce operational costs by cutting hours and wages. The arrival of the Depression made the situation unbearable, and miners were increasingly receptive when labor organizers arrived to establish unions for the workers. The United Mine Workers of America had been active in the Harlan County area as early as 1917, and intermittently active in the 1920s. In 1931, they turned their attention again to the miners in Kentucky. Also at this time, the National Miners Union (NMU) arrived in the coal counties to promote a communistic brand of labor organization. Convening rallies and dispensing food and clothes to the impoverished miners, the NMU converted many miners, including Aunt Molly and the Garland family. When the region's conservative mining families discovered the atheistic and "red" nature of NMU ideology, however, support for that union dwindled. Harry Simms was a National Miners Union organizer from Birmingham, Alabama, who came to Kentucky to help the striking miners. He was shot and killed by gun thugs near Pineville, Kentucky, on his way to meet members of the Waldo Frank Committee, a group of writers who visited the region in February 1932 to distribute food and clothing to the embattled miners. Harry Simms was a young Jewish organizer who was murdered on Brush Creek, Knot County. He was walking along the railroad track with another fellow--they were going down to meet some writers who came to Bell County to study the conditions of the miners--when the gun thugs shot him. They took him and the other fellow back to town. They put the other fellow in jail. They left Harry sitting on a rock in front of the town hospital with a bullet in his stomach. He sat there on that rock an hour or more with his hands on his stomach bleeding to death. He was sitting there because the hospital wouldn't take him in till somebody guaranteed to pay his bill. After a while a man said he would pay the bill so they took Harry in. But it was too late. This song was composed right after that in 1932 by me and my brother Jim Garland. 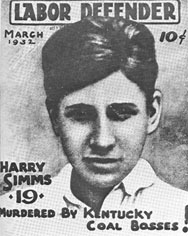 Young Harry Simms, murdered union organizer. See larger image and listen to the song below. Source: Welcome the Traveler Home. Striking coal miners march past the Bell County jail in Pineville, Kentucky, 1932. See larger image. Source: Bloody Harlan. A mining company town in West Virginia, 1939. See larger image. Source: Only a Miner. National Guardsmen hold back picket lines during a nine-month mining strike in Harlan County, 1939. See larger image. Source: Bloody Harlan.